What can you find close to our location? Santa María Inn is a hotel located close to the airport. We are just 5 minutes away from the Juan Santamaría Costa Rica International Airport (SJO). 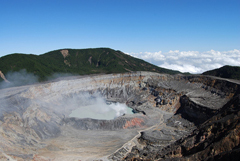 Alajuela is part of Costa Rica's Central Valley and Metropolitan Area. Our hotel is conveniently located close to the highways that take you to San José downtown (Route 1) and to the Pacific (West) coast of Costa Rica. Within an hour of our hotel you will find volcanoes, coffee tours, amazing waterfalls, rain forests, business centers and medical tourisms locations, making us a great location for your stay. In the same day, get to know the nature of the central valley by visiting Poás volcano, La Paz Waterfall gardens and a coffee tour. Experience the mystic of Costa Rica. 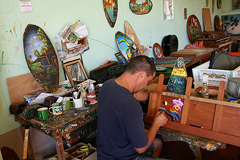 Learn how ox carts are built in Sarchí; know about the colonial times in Orosí and take advantage of visiting the Irazú volcano. Want to take it to the next level? 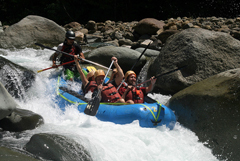 Book rafting tours to the Pacuare river, Zip line tours at the rain forest or even bungee jumping! Take a swim at the pacific ocean! 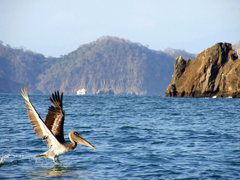 Take a tour Tortuga Island or visit a nearby beach like Manuel Antonio, Jacó, Herradura and much more! La Casona del Cerdo, Saisaki. Paseo de las Flores, Heredia. San José Nightlife: Bars, discos and restaurants. In trouble arraging your transportation through Costa Rica? We offer a direct, more affordable car rental service. Just check the box in our contact form and we will send your the rate and insurance information with no hidden costs!